Saint Ann Catholic School welcomes the summer season with seafood, Mexican food, hot rods and sizzling music! The 30th Annual Seafood Festival is Saturday, April 28th. The fun starts with a Big Fish Car Show and fun for the whole family. Follow your nose to some of the best seafood and Mexican food you will ever eat! Check out our DRIVE THROUGH WINDOW FOR PRE-ORDERS! Come and enjoin the delicious food, check out the stunning show cars and support Saint Ann Catholic School! What’s on the Menu? Your choices include Seafood Gumbo, Red Beans & Rice, Fried Fish, Shrimp Pasta Salad, Crawfish Boil, Hushpuppies, sides and Mexican food including tamales, soft tacos, Mexican refried beans and rice, chips with salsa and queso, Home-baked Desserts and more! Can I Eat There? While the seafood is available in ‘to go’ containers, we offer indoor seating as well as shaded outdoor seating areas for those who want to dine in, taking advantage of the live music from area bands and allowing time to check out the adjacent Big Fish car show. Can I Pre-Order Seafood Gumbo? Yes! Order before April 28th, 2pm!! Drive through pickup window will be available this year so you can avoid the lines! Print this Pre-Sale Order Form and mail or drop off your order with payment today! How can I enter to win the Knight Flight 2018 contest? Click here! What’s the Big Fish Car Show? An awesome showing of some of the BEST cars around! How do I enter a car? Print this SIGNUP FORM. Registration is $10 per vehicle and limited to 125 entries. Checks payable to: St. Ann’s Educational Foundation. Checks may be mailed to: 3910 Spring Ave SW, Decatur, AL 35603. Please include this registration form with your check. You can sign up the day of event as well! *Show parking opens at 10 a.m. and spaces will be occupied on a first available basis. *Food/refreshments will be available for purchase. *No dogs or alcohol will be allowed at this event. *No refunds will be available in the event of inclement weather or non-participation. *All proceeds benefit St. Ann School. *Registration fee(s) is/are not tax-deductible. This year’s Seafood Fiesta and Big Fish Car Show promise to be a lot of fun! The Big Fish car show will continue rain or shine! Please note that the participation fee is non-refundable in the event that you’re unable to participate. All proceeds go to St. Ann School to support inspiring and quality education. 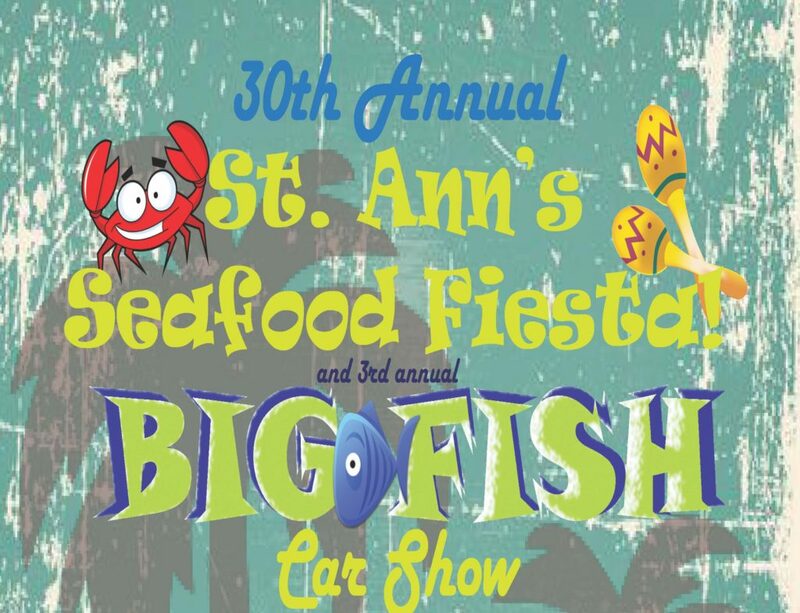 Thank you for your interest in St. Ann’s Seafood Fiesta and Big Fish Car Show! !